One artifact at a time, our researchers are uncovering and preserving maritime and pirate history. You can become part of this endeavor. Learn about Blackbeard, the Queen Anne's Revenge, and underwater archaeology with classroom-friendly educational resources. As archaeologists, conservators, and historians, the Queen Anne's Revenge Conservation Lab and Underwater Archaeology Branch of the Office of State Archaeology is dedicated to uncovering the mysteries of the past. Join us as we explore day by day the origins of Blackbeard, his famous flagship, Queen Anne's Revenge, and his misadventures along the Carolina coast. Did you Know Blackbeard's Crew was Tried in Virginia? 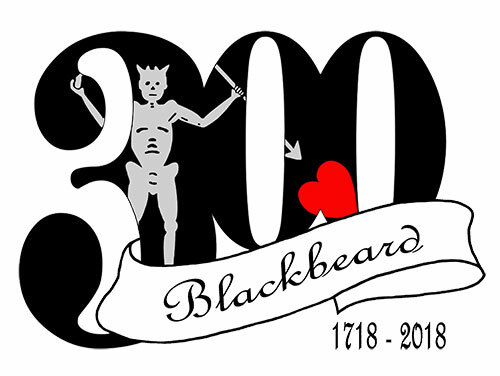 Help us celebrate the 2018 Tricentennial Celebration of Blackbeard across North Carolina. Your donation comes with variety of lucrative benefits! No registration required! Open to all ages! Blackbeard: The Science of Pirates, 300th Edition! Come out to the 6th annual QAR Lab Open House to experience the ongoing conservation of the infamous pirate Blackbeard's flagship, Queen Anne's Revenge! We are excited once again to be an event hosted as part of the NC Science Festival. Be an archaeological conservator for a day and learn how we use chemistry, physics, technology, and more through fun hands-on activities and behind-the-scenes demonstrations! The origins of Queen Anne's Revenge's, much like its Captain's, Blackbeard, stretch into an obscurity beyond the historical record. We do know that the story of QAR began long before it fell into the famed pirate's clutches. In fact, Blackbeard's captaining of QAR likely constituted only a small portion of the vessel's seafaring years. Before Blackbeard, it belonged to a wealthy French merchant, trafficking human cargo across the Atlantic on the notorious "Middle Passage." After 1718, it belonged, for a time, to the ocean alone. Since its discovery near Beaufort inlet in 1996, the remains of the vessel have become the property of the people of North Carolina, under the stewardship of the North Carolina Department of Natural and Cultural Resources. Learn more about the ongoing research and artifact preservation efforts at our lab. Access technical and conservation reports, newsletters, academic articles, and more. Have a question about our work? Get press contacts, informational materials, and more. Learn more about the seasoned researchers, archaeologists and conservators on our team. Our project draws together some of the leading scientists in the nation to advance the standards of practice in archaeology and conservation and provides students with hands-on learning experiences in maritime history, archaeology and preservation. The work that the our team does shines the national spotlight on North Carolina's Crystal Coast, bringing more than 300,000 visitors annually to the region annual and helping them explore the story of colonial North Carolina. What Lessons Can Pirates Teach? Our project tells us about more than who Blackbeard was and how pirates lived. It sheds light on the wider political, economic and social systems of the colonial period in North Carolina and beyond.